This thread has got a big volume with a lot of sites and hundreds of replies. There is no reason to waste time and to read them. All you need to know is laid down in this first post. If I get any new information, which might be important or useful, I will edit it into this post! So this first post will always be up-to-date! None of the Pre-Vista Windows Operating Systems do support the S-ATA Controller features RAID ("Redundant Array of Independent Disks") and AHCI ("Advanced Host Controller Interface"). Unless the suitable nForce Sata/PataRAID or AHCI drivers are separately presented by the user, the OS installation fails, because the OS Setup doesn't find the related RAID/AHCI drives and their partitions. A floppy drive is needed, but not available at many actual desktop computers and notebooks. Floppy disks are the worst data storage media regarding the file integrity. Bad floppy disks are the main reason for corrupted driver files. The F6/floppy method doesn't work at all with some "LEGACY mode" nForce RAID systems. Even if the user loads the correct nForce drivers and the RAID is detected by Windows Setup, the OS installation may end with a BSOD and endless reboot loops. The better alternative is the integration of the needed textmode drivers into a bootable OS CD. Only this way the user can be sure to succeed with the installation of the OS onto an nForce RAID or AHCI system. Nevertheless the developers of the driver integration method had to solve the above specified problem (see point 3). Until 2005 the correct installation of the nForce S-ATA/P-ATA Controllers and drivers needed addtional manual work of the user. They only succeeded after having created special folders and edited some SIF and/or OEM files. The safest and easiest way to get the problematic nForce textmode drivers properly installed is to integrate them by using a tool like nLite. All actual versions of nLite (Since v1.0 Final) have incorporated a special method, which guarantees the successful OS installation onto any nForce RAID or AHCI system (if the user observes some rules layed down below). The replacement of the correct nForce Controllers and drivers by the "wrong" MS IDE ones will be prevented by the built-in suppression of the MS IDE drivers during the hardware detection part of the OS installation. 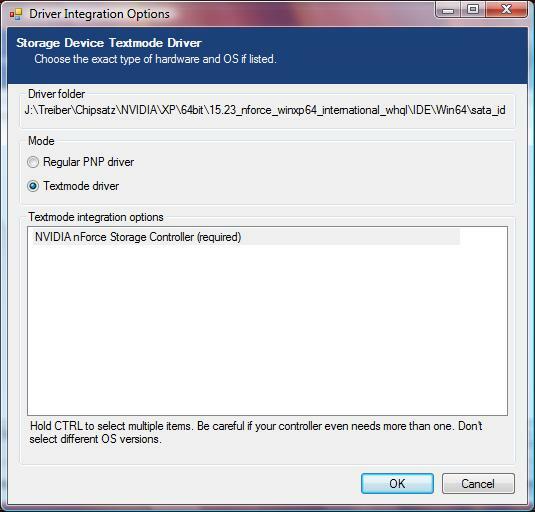 Who needs to load/integrate which nForce IDE driver subfolder? Users with such system don't have to load/integrate any nForce IDE drivers. NForce Users with enabled RAID settings within the BIOS need to load/integrate the LEGACY (for NF2-4 chipsets) or the SATARAID subfolder of the suitable nForce chipset driverpack as TEXTMODE driver. Users with an old "LEGACY mode" nForce RAID system, who want to integrate the SATARAID subfolder, additionally have to integrate the SATA_IDE subfolder as PnP driver to prevent a BSOD at the end of the OS installation. The actual nForce chipsets (MCP65 and up) do support the enhanced features (NCQ etc.) of the new S-ATA standard AHCI. 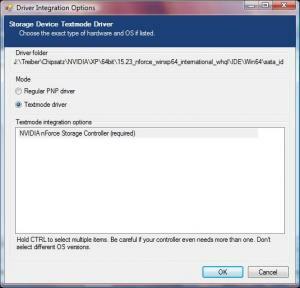 If the NVIDIA nForce S-ATA Controllers are set to "AHCI mode" (instead of "IDE mode") within the BIOS, users have to load/integrate the suitable SATA_IDE subfolder as TEXTMODE driver. Only the new generation of nForce S-ATA drivers named "NVGTS" do support the AHCI features and can be integrated as textmode driver. Suitable SATA_IDE subfolders contain a TXTSETUP.OEM file. Get the actual nLite version from here and install it (.NET Framework 2.0 or equivalent is needed). [*]Create a folder named "nLiteCD" (or similar) somewhere and copy the whole content of the original OS CD into it. [*]Start nLite > point to the content of the just created folder as source > hit the buttons "Drivers" and "Bootable ISO". [*]When the task "Drivers" comes > hit "Insert" > choose "Single driver" > point to the prepared SATARAID resp. LEGACY driver folder. [*]Click onto any of the shown INF files > a popup window will come up. [*]Both shown "required" NVIDIA products should be highlighted (already done by nLite) > hit "OK". [*]Only needed for some NF4-5 RAID systems after the integration of the SATARAID drivers: integrate additionally the SATA_IDE folder as PnP driver. [*]Let nLite burn the Image directly onto an empty CD ("General" > "Mode" > "Direct Burn"). [*]Boot off the created CD, choose the destination partition, do a quick NTFS formatting and install the OS. an up-to-date mainboard and nVRaid BIOS (= MediaShield IDE ROM), which is part of the mainboard BIOS. Actual nVRaid drivers may need a Raid Bios v4.81 (NF3) resp. v5.60 (NF4) or higher. an enabled ACPI power management (within BIOS, don't disable it by nLite settings). You can see the nVRaid BIOS (=MediaShield) version of your system on the second boot screen. If you can't get a Raid BIOS version v. 4.81 or higher after having flashed the latest mainboard BIOS, you might get problems with the integration of the latest nForce Pata/SataRaid drivers. The successful integration of the nForce Pata/SataRaid drivers into a bootable OS CD requires the presence of the latest available Service Pack (SP) of the used OS. If your OS CD does not contain any or the last SP, you should integrate the latest SP as first step, when you are going to create your nLited CD with integrated nForce Sata/PataRaid drivers. XP 32bit (x86) only: If possible don't slipstream SP3 into an XP SP1 or SP2 CD. In this case it's better to take an original ("Gold"/RTM) OS CD without any SP as source for slipstreaming SP3 and the nForce Raid drivers. Otherwise you may get problems during the installation of the nLited CD. It is a good idea to unplug all unnecessary external hardware devices during the installation of the OS with integrated nVRaid drivers. If you have any hard disk drive outside your RAID array or a plugged-in USB stick, you may get the problem, that the MS Setup routine tries to install the master boot record (MBR) onto that non-RAID device, although you have set the RAID array as first bootable hard disk drive within BIOS. The only sure way to prevent this is to unplug these non-RAID devices during the installation of the OS. After the successful installation they can be reconnected without any problems. If you are not already running the latest version of nLite, you should download it here and install it (.NET Framework 2.0 or equivalent is needed). The next step is the preparation of the nForce textmode driver for the later integration. The choice of the "best suitable" nForce IDE driver version and subfolder mainly depends on the nForce chipset details, the RAID configuration (SataRAID or PataRAID) and maybe on the nVRaid BIOS version of the destination desktop/laptop. 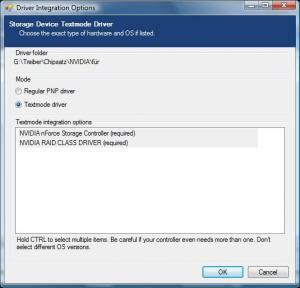 NVIDIA is offering for all nForce chipsets complete driverpacks with included nForce SataRAID drivers. You will find them, if you go here, choose "nForce" (NF5 and up) or "LEGACY" (NF1-4) as "Product Type" and then choose your special nForce chipset and the OS you are going to install. Unfortunately NVIDIA's official nForce driverpacks are not always the best choice for nForce RAID users. Either they do not work at all (example: NF4 RAID), they are outdated (example: NF2-3 RAID) or they don't provide the best possible performance (valid for nearly all NF chipsets). Since January 2008 I am offering alternative nForce drivers and driverpacks, which are actual, but maybe better than NVIDIA's official ones (for details you may look here). The used drivers themselves (=SYS files) were developed and released by NVIDIA, but for unknown reasons the manufacturer didn't add the HardwareID's of all supported nForce IDE devices. That is why I customized the associated INF/OEM files to make them compatible with as many nForce chipsets as possible. This modification doesn't touch the driver's function and the loss of Microsoft's digital signature (WHQL) has no impact on the driver's installation (thanks to nLite's built-in textmode driver integration method). This LEGACY textmode driver package contains the newest non-AHCI capable nForce IDE drivers v6.99 dated 14th May 2007. Since I have added all needed HardwareID's, this package will support all "LEGACY Mode" nForce2-5 RAID systems ("LEGACY Mode" means, that the NVIDIA nForce RAID Controllers of the mainboard do support Pata- and Sata-RAID simultaneously). Within the small package you will find the nForce IDE drivers v9.99.09 dated 01/17/2008, which have been customized by me to make them compatible with all NF4-7 chipsets. These drivers will give your nForce RAID system the best possible performance. Usually only the SATARAID driver folder will be needed for the later integration, but some users with a LEGACY Mode nForce RAID system may have to integrate both included driver subfolders (SATARAID as textmode and SATA_IDE as PnP driver). These are NVIDIA's latest nForce IDE drivers, which do fully support MCP65 and MCP67 chipsets. These are NVIDIA's latest WHQL certified nForce IDE drivers v11.1.0.43 dated 04/09/2010. I recommend to use these new drivers for users with a SataRAID system and an MCP73-79 chipset mainboard. Users with an MCP51, MCP55 or MCP61 chipset mainboard may take them too, but I am not sure, that they will get a better performance than with the modified nForce SATARAID drivers v9.99.09. The package contains the newest natively 64bit nForce IDE drivers, which have been customized by me to make them usable with all "LEGACY Mode" nForce RAID systems from nForce3 up. Even MCP51, MCP55 and MCP61 PataRAID systems are supported by them. Within the package you will find the nForce IDE drivers v9.99.09 dated 01/17/2008, which have been customized by me to make them compatible with all NF4-7 chipsets. These drivers will give your nForce RAID system the best possible performance. Usually only the SATARAID driver folder will be needed for the later integration, but some users with a LEGACY Mode nForce RAID system may need both included driver subfolders (SATARAID as textmode and SATA_IDE as PnP driver). After having downloaded the suitable driverpack and unzipped it with a tool like WinRAR or 7-Zip everything is prepared for the later integration procedure. Create a new folder somewhere on any available hard disk drive and name it as you like (for example "nLiteCD") . Copy the whole content of the original OS CD into the just created folder. Don't use or reuse any already nLited or modded source. Check, if you have already running the latest nLite version. If not, download and install it. Choose your language > hit "Next"
Hit the "Browse" button, find the path to your just created folder "nLiteCD" (or similar) > click onto the folder name. Now you can see the OS details inclusive the eventually already integrated Service Pack version > hit "Next". Don't import or enable any presets > hit "Next". Now you will get the Task Selection page. You can enable all offered tasks (not recommended for newbees), but you have to enable the tasks "Integrate Drivers" and "Create Bootable ISO". You should additionally choose the task "Integrate Service Pack", if the OS SP version is not actual. Don't enable any other tasks, unless you are already familiar with nLite and nearly sure, that the nLite CD will work with your system (the more you are adding, tweaking or removing, the more difficult is the search for the reason, if the OS installion should fail). [*]When you get the "Drivers Integration" page > hit "Insert" > choose the "Single driver" option > point to the prepared SATARAID or LEGACY folder with the suitable nForce Sata/PataRAID drivers > hit onto any of the shown INF files (=files with the suffix ".inf"). 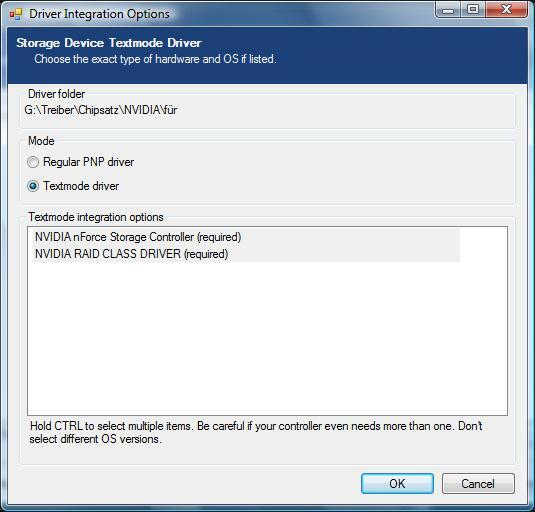 Both listed "required" NVIDIA products ("NVIDIA RAID CLASS DRIVER" and "NVIDIA nForce Storage Controller") have to be enabled. Usually nLite has already highlighted both of them and set the integration mode to "TEXTMODE" (if not, you should do it manually) > hit "OK"
Important: Users with an NF3-5 chipset RAID system, who had just integrated the SATARAID folder, may need to additionally integrate the content of the SATA_IDE subfolder of the same driverpack as PnP driver to get the OS properly installed. If you have integrated all needed nForce Sata/PataRAID drivers > hit "Next"
[*]Let nLite start its processing > hit "Yes"
[*]After the successful nLite processing > hit "Next"
[*]As last step you will get the "Create Bootable ISO" page. Within the "General" section you can choose the "Mode". You have the options "Direct Burn" (burns the image directly onto an empty CD/DVD), "Burn Image" or "Create Image" (default setting). If you don't want, that nLite burns the Image itself, you should let nLite create the ISO file by hitting the "Make ISO" button. After having chosen the storage place and -if applicable - a special name for the ISO file > hit "Store". [*]At this point nLite has finished its work. If nLite hasn't already burnt the Image onto a CD, you have to burn the stored ISO file as bootable Image by using a burning tool. You will get the best results with Nero Burning ROM, when you choose the options "Recorder" (on top task bar) > "Create Image...." > point to the ISO file nLite has created > hit "Burn". Tip: Burn at no more than 8x(DVD) or 24x(CD) and choose the "Verify" option of Nero to avoid any burning errors! At the end you will have a bootable 32bit or 64bit Windows OS CD with integrated NVIDIA Sata/PataRaid drivers - no F6 and no floppy will be necessary. Make sure that your BIOS settings are ok. You will only be able to install the OS by booting off your nLited CD, when the CD-ROM device with your nLited CD is set as first bootable device. Before you begin with the installation of the OS by using your nLited CD, make sure that there is no floppy within your floppy drive, no USB stick within any USB port and no Memory Card within your Card Reader. If you are using more than 2 GB of RAM, it is a good idea to remove 1-2 sticks during the OS installation (otherwise you may get a lot of errors during the OS Setup). Once the OS is up, they can be reinserted. Don't hit F6 and don't insert a driver floppy if you install an OS by using a CD with integrated nForce SataRaid drivers! Actual nForce chipsets (MCP65 and up) do support the advanced S-ATA-Features (z.B. NCQ) of the AHCI standard. Users of such systems usually have the BIOS option to set the nForce S-ATA Controllers to "AHCI Mode" instead of the "IDE Mode" (which doesn't require any separate textmode drivers). If AHCI is enabled, Windows Setup will not detect the S-ATA hdd('s) unless the needed AHCI drivers will be loaded (F6) or have been integrated into the OS CD. [*]choose the tasks "Integrate Drivers" and "Create Bootable ISO"
let the "NVIDIA nForce Storage Controller (required)" enabled > hit "OK"
If you have followed my guide until this point, you can be rather optimistic, that you will get the OS perfectly installed onto your nForce RAID or AHCI system, but the success is not guaranteed. The prepared CD doesn't boot. ("Hit any key to boot off CD/DVD" message is missing). Reason: Either you haven't set the correct boot device order within the BIOS or you didn't burn the ISO file correctly. Solution: The CD/DVDROM device has to be set as 1st bootable device and the ISO file has to be burnt as bootable Image (see above). Windows Setup doesn't detect the RAID or the SATA drives, which were set to "AHCI Mode". Reason: You obviously didn't integrate the "suitable" textmode drivers or didn't choose the needed Controllers during the integration procedure. Solution: Check the exact chipset name of your mainboard, the BIOS settings and the sort of the S-ATA Controllers, where your hdd's are connected (example: you can't get Silicon Image S-ATA Controllers working with nForce drivers and vice versa). After having found the "correct" textmode drivers you have to restart the integration procedure from scratch (don't reuse the nLited source again!). You get a message like "The file NVxxx.SYS is corrupt." Reason: You obviously mixed the 32/64bit textmode driver version or you didn't use a clean source. Solution: Start the nLite processing again from scratch with a clean source and integrate the correct 32/64bit textmode driver version. XP, W2k and W2k3 can only be installed by using 32bit textmode drivers, whereas the 64bit Operating Systems (XP x64/W2k3 x64) need 64bit drivers. You get an error message like "Cannot find file NVxxx.SYS". Reason: You either didn't integrate the textmode driver or you tried to additionally load it by F6/floppy method. Solution: Don't hit F6 when prompted, if you have integrated the textmode driver. The OS installation fails at last reboot with a short BSOD and endless reboots. Reason: You either didn't choose the correct driver integration method or your optical drive is connected to a S-ATA port, which is set to RAID or AHCI. Solution:Connect the optical drive to a non-RAID/non-AHCI S-ATA port or take an IDE connected CD/DVDROM drive for the OS installation. Once the OS is up, you should install the complete "suitable" nForce chipset driver set. The best suitable driverpack is that one, which contains the same version of nForce IDE drivers as the integrated ones (v6.99, v9.99.09 or 11.1.0.33, if you had followed my advices). That's all - I hope, that you will succeed with the integration of the drivers and with the installation of the OS onto your nForce RAID or AHCI system. This guide contains a lot of links to drivers, which have been modified by me to make them usable for nForce chipset users. As you certainly understand, I cannot overtake any warranty for the function and the quality of the drivers. You may use them nevertheless, but at own risk. The easiest way to get the Raidtool installed is by running the SETUP.EXE of the associated nForce chipset driver package, but by doing this all nForce IDE drivers of the package will be installed too (and maybe replace the better and currently working ones). In these cases you have to use another way to get full access to the MediaShield/RAID software (NVIDIA Control Panel) after having completed the OS installation. Now you will see the MediaShield Control Panel. It should also appear as NVIDIA Control Panel within the Vista Control Panel, but if it doesn't, try to install nTune on top. For further information about the abilities of the NVIDIA MediaShield software you should open the MediaShield help file (as .chm or .pdf), which you will find within the extracted raidtool files. Suggestion: You should create shortcuts to the .EXE files of the RAIDTOOL folder and put them into your Startmenu folder. This way you will get an easy access to all services of the MediaShield/Raidtool. Users with an nForce Sata-RAID array, who are going to install any OS onto an IDE or non-AHCI S-ATA drive, which is outside the RAID, should not integrate any nForce SataRaid drivers. They will be able to get the OS installed without any problems. Once the OS is up, you should run the installer of the suitable nForce chipset driver package. After the reboot, the RAID array normally will be detected by the OS. Open the Device Manager and check, if you see the "NVIDIA nForce RAID Controller" within the "SCSI and RAID Controllers" section. If not, you haven't enabled the NVIDIA RAID Controllers within the BIOS. If you see the "NVIDIA nForce RAID Controller", you have to open the "IDE ATA/ATAPI Controllers" section and look for the "Standard Dual Channel PCI IDE Controllers", where your RAIDed SATA hdd's are connected to. Right click onto these Controllers and do a driver software "update" until you see the compatible devices. Choose the "NVIDIA nForce Serial ATA Controllers", if they are shown as compatible. After the reboot your OS will see and will be able to work with the datas of the RAID array. are you using the newest driver to test it? Very good of you Fernando 1. I will surely give this a try. I am sure this info will be helpful to Nuhi in future releases. Whatever happened in beta 5 im sure will be fixed in the next release as you proved beta 4 works fine. Perhaps the info you just stated can be automatically done by nlite in the future with the created of directories, placing of files etc. I will give this a try shortly and let you know! Yes, I tested it with these drivers from the chipset package 6.66 (32-bit on Windows XP and 64-bit on Windows XP x64 Edition). The package is published as WHQL-certified, but the drivers, which make the biggest problems integrating them into a CD, the NVATABUS.SYS (32-bit) and NVATAX64.SYS (64-bit) are not! Same reboot on startup as was occuring with the other method. Can you clarify what INF and directory I should be using to slipstream drivers for a SATA RAID drive array? Thats right! You have to take the nvatabus.inf file from the folder PATARAID. I will clarify this in my first post. You've clarified that nvatabus.inf must come from PATARAID folder (even for a SATA RAID array which makes no sense but I will trust you on this)... What about the other two files (idecoi.dll and nvatabus.sys)? Does it matter where they come from? Also, When you say "integrate the latest NVIDIA Sata/Raid drivers as textmode drivers" ... What freakin directory are you integrating in nLite? Why are you using PATARAID drivers to setup a SATA RAID Array? You are right - it seems to be confusing, but this exactly is the trick of the method I described here in this thread. The [OemInfFiles] method enforces the installation of the needed, but still not WHQL-certified driver NVATABUS.SYS and prevents, that Windows XP installs the wrong MS Standard-IDE-Controller driver. Nevertheless you have to copy the file nvatabus.inf from the subfolder PATARAID into the fresh created subfolder OEMDIR. This file is not a driver, but it is needed to give MS informations how to install the driver NVATABUS.SYS. When you look into the subfolder SATARAID, you can find the needed driver NVATABUS.SYS, but no information file for this driver (NVATABUS.INF). That is the reason, why you have to take the one from the PATARAID subfolder. So even if I am using SATA Raid I will still need to copy the nvatabus.inf from the PATARAID folder? Otherwise the necessary driver NVATABUS.SYS would not be installed and your system would not work after the installation. This is quite a discovery for me as I am facing problem installing Windows on Raid with F6. Maybe it is becoz I did not copy nvatabus.inf to the diskette that make the installation fail. You did save my day!! After using the file "nvatabus.inf" from the subfolder PATARAID, my Raid-0 is up and running again.